As discussed in class, language holds much more significance than merely a form of communication. Language is rich in culture and represents tradition through various forms of dialect and expression. The official language of Congo is French. The language was inherited from the colonial period when the country was under Belgian rule. According to Wikipedia, Congo is currently the most populous French-speaking country. It is used in business, legal, political and academic meetings. In addition to French, the country has more than 200 indigenous languages. From those, four additional languages have gained the status of being a National language for the country. These are, Kikongo, Lingala, Swahili and Tshiluba. Kikongo is a dialect continuum with several varieties which may not be mutually intelligible, meaning there are different variations but all can be easily interpreted by fluency in Kikongo. 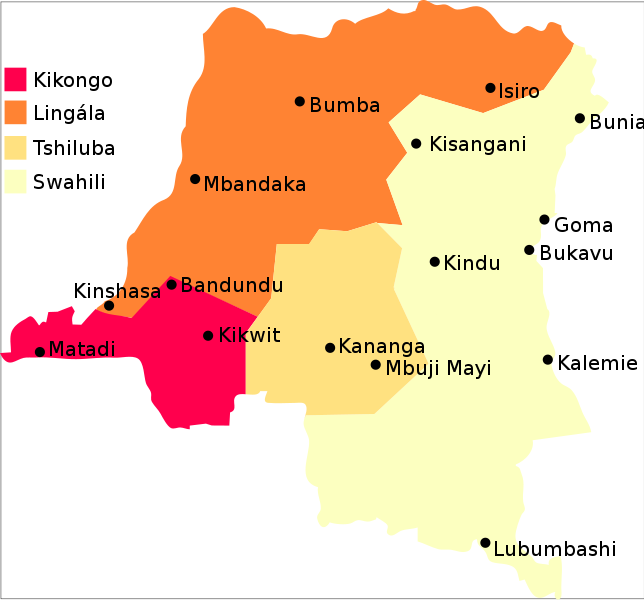 Kikongo is most commonly spoken in the Eastern tip of the country in cities such as Kikwit, Matadi and Bandundu. The Lingala language gained its modern form in the colonial period from the push of missionaries wanting to make the language more uniform as well as teach a local vehicular language. Currently, Lingala is the official language of the Army. The language was originally spoken in the upper Congo river area but rapidly spread to the more central areas of Congo. Cities speaking Lingala include as far south as Kinshasa, to Mbandaka, Bumba and in the Northwest region, Isiro. Swahili is the most spoken vehicular language in Eastern Equatorial Africa (the region of Sub-Sahara Africa intersecting with the equator), according to Wikipedia. Many variations of Swahili are spoken in the country with the most common being Kingwana, also known as Copperbelt Swahili. The language of Swahili is mostly spoken on the western side of the country. From as far south as Lubumbashi, to Kindu, Kisangani and as far north as Bunia. Lastly, Tshiluba has two major variations, with neither of the forms being specified in the constitution as the national language. One form of Tshiluba is Luba-Kasai, spoken in the East Kasai Region. The other form is Luba-Lulua, used in the West Kasai Region. Tshiluba is spoken in the South Central region of Congo. As evident in English, the various dialects give clues as to where the speaker was raised or is currently living. For example in America, a twang sounding accent can be assumed to be from the South while a more nasal, faster pace accent is from the North. While we are grateful English is still a prominent language, many smaller languages are losing speakers and with it, culture. According to Vanishing Voices by Russ Rymer, by the next century an expected one-half of the world’s languages may disappear. Imagine living in the South and no longer hearing the use of y’all or being told to wash up for supper. For less prominent languages, this fear is very real. With fewer speakers, traditions and cultures have a lesser chance of survival.